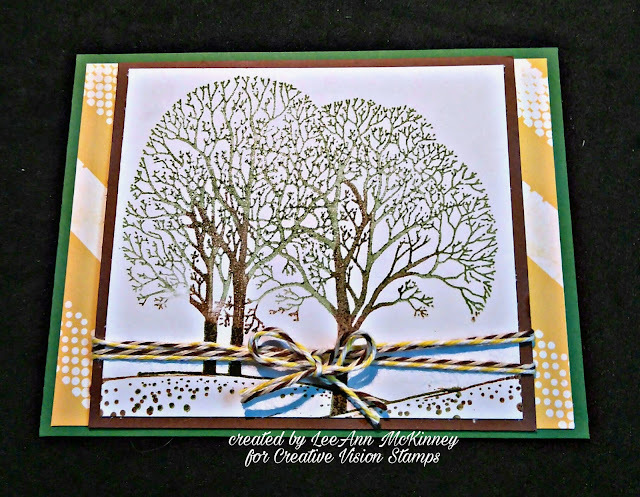 Greetings friends and fellow crafters, LeeAnn here with a project for Creative Vision Stamps that as soon as I saw this set in my package I knew I had to do. Using the 3 Bare Tree's rubber stamp set, I inked the image up with Nuvo Acorn Brown and Safari Green Hybrid Inks. I then used Nuvo clear embossing powder to add a little shine. I then went back in with the same stamp and extended the land lines on both sides of the image to complete the look. I embossed that in clear as well. I went through my pattern paper and found this white and yellow diagonal sheet, used brown/white and yellow/white Bakers Twine, I wrapped my tree panel twice, tied a bow in the middle and was happy. My layers are adhered with double stick tape.